This year will be the first time I've ever spent Thanksgiving apart from my family on the east coast. Since many of us "kids" have ended up here on the west coast, we'll be having our own younger generation T-day celebration here in Berkeley. And that brings me to another first - I'll be roasting my first turkey! 1. I am going to brine the turkey before I roast it. According to many sources (including Martha Stewart), brining a.k.a. soaking the bird in salt water for many hours, helps to ensure a moist, flavorful turkey. I'll write more about this soon. 2. I am going to buy the best-tasting, "happiest" bird I can find. Around here, that appears to be a Willie Bird, a free-range, organic turkey from Willie Bird Farms near Santa Rosa. I have to say that I am still recovering from the sticker shock - the smallest turkey they sell costs nearly $100! I am hoping that part of that price is the cost of them FedExing it to you and that it will be slightly cheaper to pick it up from a local grocery store. 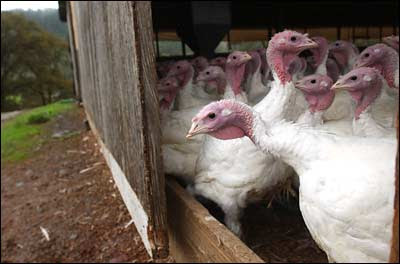 For those of you who don't live in northern California, you can consult the Eat Well Guide (http://www.eatwellguide.org) to find a good source for free-range (possibly organic) turkeys near you. If you happen to live in Vermont, I'll save you the trouble. Below are links to the two places my Aunt Katy (the owner of Healthy Living Natural Foods market in Burlington, VT) recommended. I'd take her word for it, she's definitely done her homework. Big thumbs-up on brining. Do some planning beforehand as it takes up more space than you'd anticipate (and unless you are going to be really diligent and change the water/ice to a cooler, you have to use the fridge. I have used a large canning pot and put the bird/water inside a plastic bag (and put that in the pot). You can then use large cans/jars to shore up the bag so that the water remains on top of the bird. It might be easier to explain/demonstrate in person (so if you are a Berkeley reader, we can schedule a demo). One more thing - homemade stock! You should make your own stock for the real experience (and then make gravy from it). However, DON'T use a carcass from a brined turkey for the stock. I like things well-seasoned but it will be way too salty. If you run out of time (and you are lucky enough to live in the Berkeley area), consider purchasing your stock from Magnani on Hopkins. You might look at where Magnani gets is birds from. Will Bird is renowned but there may be ways to avoid the high price. Wow. Agreed on the brining - a must-do step. I think that we rinse the bird after, though, since the time we didn't it came out so salty it was ridiculous. I wonder if that's "not done" but just something to consider. One more thing on brining: DON'T brine a certified kosher turkey. The koshering process includes the use of salt and you will end up with an unpalatable bird if you brine on top of that. Eve, I brined my first turkey last year. I did a test turkey the week before that was amazing, but just a bit too salty. So i pulled back on thanksgiving...and, it wasn't as good. I used a combination of Martha's and Cook's Illustrated recipes, btw. Diane at sustainable table said that brining is only necessary if you're not already working with a really good, tasty bird and that it will just ruin the flavor of a really good bird. Generally I agree with what Diane said (just not with turkey). If you start with excellent product, you can ruin it by doing too much. However, a turkey is a uniquely challenging item to cook. And, if you have never cooked one, it is even more so. The cooking times for the white meat v. the dark meat varies (juicy breast = raw thighs; juicy thighs = dry breast (hmm, that looks funnier than when it was in my mind)). It is so hard to get the bird right so that it is juicy in all parts but also done so that you don't run the risk of making your guests sick. Pulling it off is a real accomplishment. Brining, even terrific product, goes a long way to mitigating the risk of a bad result. I have not roasted many turkeys but have done a few and have eaten my share of dry white meat and I also have a lot of respect for quality product. All that said, I would definitely brine even the best quality bird. Without question.